Local Search Engine Optimisation is a slightly different tactic to SEO in general. It means that you’ll appear in searches from users in and around your local area, which can be extremely helpful if that’s where your ideal customer is located. 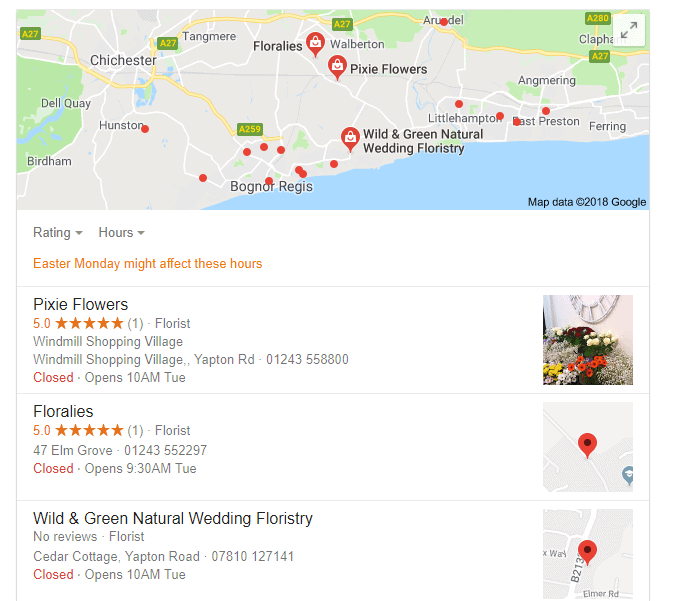 If I was a florist or retailer based in Chichester, I’d probably prioritise local search in my strategy to make the most of the leverage it could give my business. Whereas a search where Google can’t see my location, turns up the biggest competitors in the florist industry like Interflora – which isn’t helpful for the much smaller companies that turn up in local results. This is where you can leverage local search! It can be hard to know where to start so I figured these 3 points would be most helpful to you and points 2 and 3 would be easy enough for anyone to attempt. Clean up the technical side of your website. As with any approach to SEO, this is the first area you should address. If you don’t, not only will Google not like your website, your users will struggle to navigate it effectively and potentially lose trust in you. I recently worked for a company that had 3000 404 errors, so I was tasked with redirecting each and every one of those pages and that was only the start, they had over 2000 broken images and links to clean up too. It shouldn’t come as much of a surprise that the company very rarely received an inbound inquiry. Google loves directories! It’s hugely valuable to get listed in geographically defined directories and the great thing about these is although they don’t often offer ‘do-follow’ links, Google looks at them as a reason to trust you. This can help you improve domain authority quite quickly and boost your local ranking in a fairly short space of time. Google My Business and Bing Pages for Business – they’re technically directories but so valuable that it’s worth dedicating time to them to optimise and update. Make sure you fill every single section and add 3 or more photos, regularly post offers and product information too. Leverage your location to beat larger more established competitors that are based outside your location. More website hits from the customers you want and can effectively serve. I hope this post is helpful – I’d love to know what kinds of results you’re getting. If you’re interested in more than local SEO, please take a look at our Search Engine Optimisation Service or experience local search engine optimisation benefits by implementing our approach to local search engine optimisation.